“Being consistent is the hardest thing of all,” many parents tell us. And it’s so true—it’s easy to lay down a rule and then let it slide when you’re tired or in a hurry. In this article, Janet Lehman explains why consistency is the key to your child’s behavior—and tells you ways to keep on track when you feel like giving up. I don’t think beating yourself up is the answer to anything. I think that shame and remorse only make the problem worse; they only make you angrier on the inside as a person. When your child is young, he starts to learn simple math. The way he learns is through a process called “rehearsal and repetition.” At first, simple addition and subtraction are the most alien concepts in the world to him. But slowly, he begins to understand that two and two equal four—and then he builds on that knowledge. Consistency is imperative. Look at it this way: what if two and two didn’t always make four? How would your child learn addition if the rules were always changing? If that was the case, he would never learn how to solve math equations correctly or adapt his learning to tackle more complex problems. This learning process is called “internalization” because your child takes it from the outside in; it becomes part of him on the inside. Consistency is one of the main requirements for kids to learn how to predict things. In other words, I can predict that two and two equal four. Can I predict how my mother is going to act if I throw a tantrum? Can I predict how my father will react if I’m late for school? Can I predict how my parents are going to act if I don’t do my homework? Let’s face it, predictability is one of the foundations of our society—that’s why we’re disturbed when the trains don’t run on time or the post office isn’t open. For kids, inconsistency produces anxiety. Think of it this way: what if your boss was nice one day and mean the next? What if she said “good job” to you and then turned around and said “that’s unacceptable” after you performed the same task the exact same way? Or what if your employees showed up to work sometimes, but didn’t show up other times? Kids need to be able to predict that two and two are going to be four the same way they need to be able to predict what time they’re going to go to bed, how they’re going to be dealt with if they curse, and what’s going to happen if they don’t do their homework. Consistency is a key learning tool for your child, because when something is consistent, he can rehearse it and incorporate it inside of himself until it becomes a part of him. Let’s look at it this way. What if one day you don’t clean your room and your mother yells and screams at you to “get in there and pick things up”? And what if the next day, she’s in a hurry so she picks it up for you? And then, what if two days later she yells at you again? And then on Saturday, she picks it up for you because company is coming over. What are you learning? Most kids learn that if they put up with their mom yelling at them a little bit, eventually she’ll clean their room. The other thing that happens is that they don’t know how their parents are going to react; they’re effectively learning how to live with anxiety and chaos. They’re learning that the world is not predictable and adult responses can’t be gauged. As a result, different characteristics develop in different kids. Some become aggressive and hostile, while others become compliant and passive. All of them learn to deal with unpredictability, which again, creates anxiety. Kids have to develop the capacity to deal with anxiety when they’re young, so this can be overwhelming to their defenses. Sadly, they often wind up solving problems using inappropriate behavior. Why Is Consistency the Hardest Thing for Most Parents? Again, internalization, rehearsal and repetition—these are the keys to learning. Believe me, if the parents I worked with thought anything was hurting their kids, they would do their best to try to change it. But many saw inconsistency as just being human—and in a sense, they were right. They were overworked, overwhelmed and often exhausted. But the bottom line is that choosing expediency over consistency has an effect on your child’s behavior and character. The truth is, many children today are aggressive and destructive, and this emanates in part from inconsistent parenting. It’s easy for parents to beat themselves up when they get this information. Maybe some social worker, psychologist or teacher is telling them that they’re not consistent enough at home. It’s easy to feel beat up, resentful, and overwhelmed. But the bottom line is, parents often blame themselves and feel like they’re not doing a good job. Sometimes they blame their child, or the counselor for not understanding what it’s like for them. But here’s the deal: I don’t think beating yourself up is the answer to anything. I think that shame and remorse only make the problem worse; they only make you angrier on the inside as a person. I understand that parents do get worn down; often they’ll try to be consistent, but if they don’t see change right away, they give up. Personally, I think giving up after a few days or weeks is one of the biggest mistakes you can make as a parent. Changing a behavior takes a long time and it takes consistent application of new principles and ideas in order for kids to incorporate them on the inside. And until then, your child needs a parent to structure his life and set limits on him, because he’s a kid—not a little adult. Children don’t think like adults, they don’t see the world the same way as adults do, and they don’t experience things the way we do. A young child’s mind works very differently from ours, and so does an adolescent’s. Until their early twenties, kids’ minds are constantly shifting and changing in the way they operate. If you talk to a guy who’s 21, he usually wants the same thing as a kid who’s 16 does: a car, an apartment, a girlfriend, electronics. He hasn’t changed very much; he’s not yet an adult. If you talk to that same person when he’s 30, he’ll say he wants security and predictability. Perhaps he wants a career that’s worthwhile, or wants to make some money. He’s thinking about saving money, investing in things, and his future. Most 22 year olds aren’t thinking along those lines yet because their brains are still developing. What time is hygiene time in the bathroom? What time is homework time? All of these rules were written down on a piece of yellow paper, and then the parents began to incorporate them. I advised parents to read this list out loud to themselves every morning. Some thought that was crazy. They’d say, “How can I do that? I’ll feel stupid.” But the concept of rehearsal and reinforcement is important with parenting, too. As a parent, you need to rehearse this new information. The process of reading it out loud reinforces your new techniques and rules. Then you put them into practice. The day will come when you don’t need to read your list out loud, because you’ll be living it. It’s a simple tool but it’s one thing I teach parents in order to help them be more consistent. Get the Support You Need: If you don’t understand how important consistency is and you don’t know how to apply it on a regular basis in your home, you need to get help. 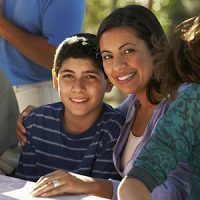 There are parenting programs, classes, support groups and professionals out there who can help you. Parents ask me if they should sit down with their kids immediately and tell them what the new household rules are. I think that the last thing that you want to do is make a big announcement to your kids about all the changes that will be taking place, and then not follow through. What tends to happen is that you’ll feel better for a little bit, but then when you don’t follow through, it falls apart. Instead, the first thing you should do is start instituting your new rules. Expect resistance, depending upon the age of your child. If they’re five or six years old, expect tantrums. If your children are older, expect arguments and door-slamming. Although it might not feel like it at the time, these are all signs that your new techniques are working. Your child might push back, but stick to your guns. The older the child, the more resistance you will face. Expect to be tested. In fact, whether your child is four or fourteen, expect to be tested. Above all, don’t give in— the testing will diminish in time. The other thing you need to ask yourself is, “Are my expectations realistic? Am I being consistent about the right things?” If you’re being consistent about a seven o’clock bedtime for a young child, that’s great. If you’re being consistent about a seven o’clock bedtime for a 13-year-old, I think you should take another look at that. Remember, parenting, just like childhood, is a dynamic that keeps developing. It takes constant readjustments, flexibility and firmness. In the end, there is no “secret” to consistency—it’s just the willingness of a parent to take the time to stick to the rules they’ve laid out for their child. The benefits of consistent parenting are that your child will internalize your rules and values over time and learn to do things with simple reminders rather than conflict.